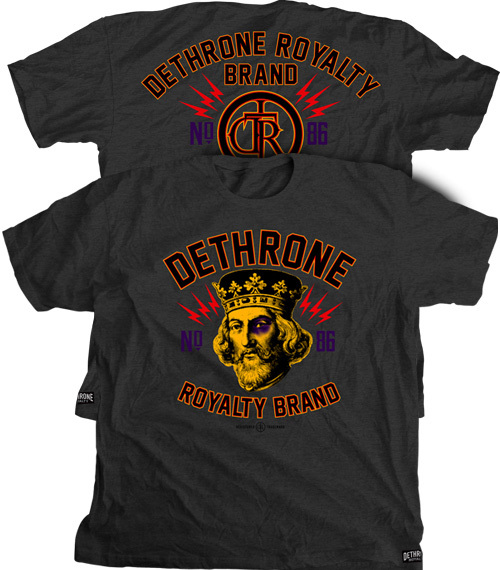 Also known as the Dethrone Dotted Eye Shirt, here’s the Dethrone Matt Wiman UFC 132 Walkout Shirt! Another lightweight battle will commence at UFC 132 as Matt Wiman faces off with Dennis Siver. On his way out into the Octagon, Matt Wiman will be wearing the Dethrone Matt Wiman UFC 132 Walkout Shirt. Also worn by fellow lightweight Gray Maynard at UFC 130, this shirt features a 60% polyester / 40% cotton fabric blend which makes it optimal for casual use and training, as it is performance fitted. It features a graphic of a king with a black eye, which I actually find pretty funny. The Dethrone Matt Wiman UFC 132 Walkout Shirt is available at MMA Warehouse.